The 21-year-old has coded for tech giants like Instagram and Uber, and now he's on a mission to level the playing field. My name's aren't your son you. From Los Angeles, California cool and I define myself as an architect from you. If you. When the first iPhone came out wasn't very pivotal point you know for me as young teenager seeing Steve Jobs introduced just for the world. I thought. I just themselves in the future. I just started until lightly for about two years straight and I ran on every programming language in existence. I would meet somebody from goal. That notice me reading all of these books and came to mean asked me why and I told him that I wanted to help the world. About the age of thirteen on essentially shadowing him and turning Google. I attended an Italian arm on high school in the south bay that was sort of of issue of under staffing. In a students were finding it very difficult to navigate. Throughout the whole campus. Like you know I'm an idea why don't I create. An app. The school receptive of it and then and about. Among we had over 400 to 500 students downloading this and using it and we just saw that the school had a they're better productivity rate that would lead me did you know meeting pres Obama. For me to be able to. Stand in front of a world model that I could be in touch and feel and hear it was very impact fault and they wanting that really resonated with me that he said. Was that he liked my Afro and it reminded him of the universe himself and saying that. Was assigned an affirmation for me that I can be in that same position. Babbitt's on what that meant to me is carry across. You know throughout different stages in my career you know whether that was sort of a Twitter and Seagram our snap Chad where. Still being authentic civil war I was. And to this day I think there's nothing that I can do so impressed my mom more community north comma hook. I'll find people's had a new idea for what you were doing and just the political influence you have. It's not Smart for you align with just a certain person. The kids that look just like me can speak just like me and and Wear clothes just like I do. Influenced him I would have to make. Information and make tax. Back collaboration with Nixon was very important because in many ways nooks and authenticated me. Flood tomorrow we're. The grand opening of the world's first marks little or Smart people. Behind the store and it was it was amazing it was shut down to block. We had one of the most OG street people. Literally co signing and he just gave be like if instant likes. You know he did to people from totally different world. But hasn't that Communist past and Bologna and pathogens a world. Guide younger people and to know when that you can be cool and Smart and then you should have to com. Angie is widely known as and that generation they grew up in a world dominated by the presence of and I didn't tell talk awhile back and I was explains people that. Tech buy if it isn't just about. The people behind these algorithms it's also about identifying. Problems. That a specific demographic hats for minority growing up in this era. We risk the chance of losing the fiesta table where icy death and being able to. Literally. Create anything but not using that skill set or that privilege. To. Disenfranchise. You know displaced people using that. For the greater good of humanity and amazing yes even bigger things ahead for mr. sandy their roofs we're gonna be on the look out. The St. Louis native details her journey to gracing runways from Dior to Versace - and living out her other passion in coding, empowering girls in the tech world. 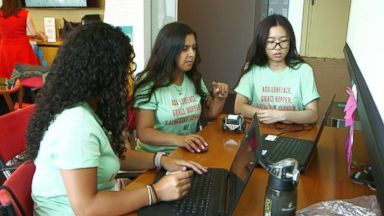 "GMA" goes inside a girls-only computer programming class that aims to change the way girls think about science, technology, engineering and mathematics. Meet the kids, their counselors, and the robots they learned to program themselves. Hear from their parents and find out how America's kids need to prepare for an increasingly technical world.